My electrical workbench is in a different room than where my radio gear is located. I decided about 2 years ago to separate my spaces as they have different requirements. 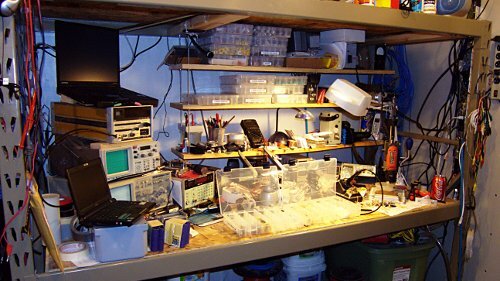 Image below shows a portion of the room that hosts my workbench. 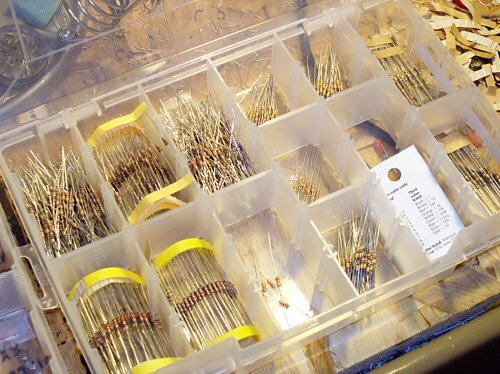 Tonight I spent a couple of hours sorting some more capacitors, LEDs, and resistors. I have a lot of these medium sized plastic parts containers. I have a lot more parts boxes than what is in this picture. 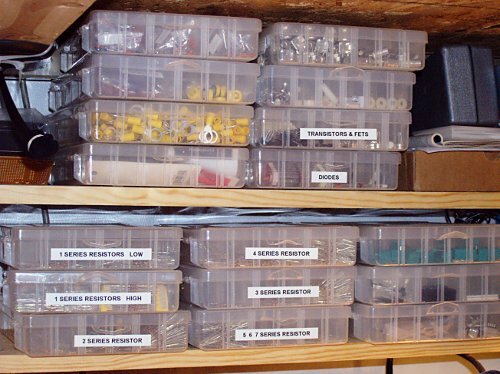 I am trying to sort everything and label the containers with basic information about what "category" of parts they contain. Eventually I am going to need to build a couple of shelves that are dedicated to holding the parts boxes. 12 months ago you probably would have laughed because I had virtually no parts on hand. I had a very small junk box. I would call N0FP to "borrow" 1 or 2 pieces of x or y. I have made point recently of acquiring a lot of standard components. When I started to look at the kinds of projects I am building I noticed a HUGE amount of overlap in the common components. Mouser, Digikey and eBay have been my friends recently. It is nice to be able to do some design work in the shack/office and then take the schematic to workbench, grab a couple of parts boxes, and then melt some solder to make a circuit. Yeah... my bench is mess... I was sorting parts and boxes tonight when I took the pictures while cleaning.